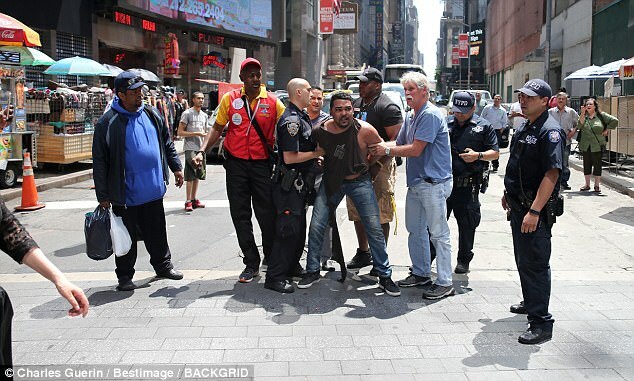 A fast-acting bystander helped police capture the out-of-control motorist accused of mowing down more than 20 pedestrians - and killing one - in Times Square in New York City on Thursday. Ken Bradix, 47, was at his job as Door Host Supervisor of the area's Planet Hollywood restaurant when Richard Rojas mounted the curb. When the 26-year-old tried to flee the scene after crashing his car, Bradix got to him first, tackling him to the ground before others arrived to assist. The bouncer laid on top of him until police appeared to arrest him. Bradix spoke exclusively to DailyMail.com about how the day's events unfolded and, while many have described the Brooklynite's actions as 'heroic', he says he doesn't see himself as a hero in any way. Bradix clocked into work around 9:30am and was there for about an hour and a half when he heard screams. A crazed Rojas was pictured trying to flee police immediately after the crash, running across the road with his arms flailing. 'A traffic agent was yelling, "Get him! Get him!"' Bradix remembered. Alpha Balde, 57, a ticket agent for CitySightseeing was the man who originally saw Rojas fleeing. Bradix added: 'There were three of us on him. He was face down still screaming. When police arrived to arrest the crazed driver, who was believed to be high on synthetic marijuana, Bradix got off of him - but Rojas got into a fistfight with an cop as officers struggled to arrest him. Bradix held Rojas's head against a construction site wall so officers could cuff him. The bouncer said the realization of the day's events began affecting him as he was walking back to work and saw pedestrians laying on the ground. 'I walked to 43rd Street and I saw a guy laying on the ground with a tube down his throat and that's when it started to hit me,' he said. Bradix spent a couple of hours by himself before relaying to his coworkers what had happened. Many of them lauded him as a hero, but he doesn't see his actions as being heroic in anyway. 'I think it's just doing the right thing,' he said. 'I was helping the NYPD out and the victims whose families couldn't be there. And I wasn't the only person who helped. Bradix says tomorrow he'll be going to work same as usual tomorrow and while he'll be there physically, it'll be much different mentally. 'It's up-and-down right now,' he said. 'Today was a very sad day in Times Square. Our thoughts are with all the victims and their families. 'Ken is an amazing man. He is spectacular at his job and, as you saw today, he will go to any extreme to help.